Cornwall Ontario – Not sure what’s wrong with security at the SD&G Highlanders Armoury in Cornwall Ontario? 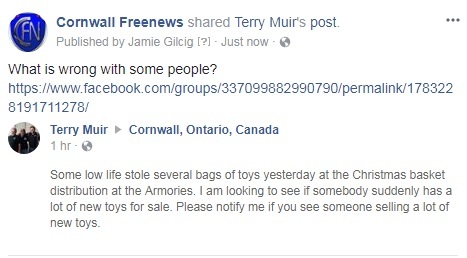 After a Submachine gun was stolen, a story broken by CFN LINK, Cornwall’s favorite Santa, Terry Muir (who boycotts this newspaper) posted on social media that a pile of Christmas toys were stolen from the armoury! Not sure what kind of scum bag would steal from kids. This writer isn’t sure which is worse, thieving of this nature or the fact that it seems that anything can be stolen from a Federal Institution? No notifications have come through Cornwall Community Police as of press time.